The Messy Beaders' Club: Messy Beader = Messy Beadwork? 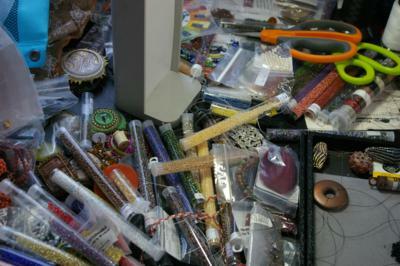 Messy Beader = Messy Beadwork? So, tonight, I was putting the finishing touches on a new project, and it suddenly occurred to me what a painstaking piece of beadwork I had just completed. It used two sizes of Swarovski bicones and size 15 seed beads to make a three-dimensional circle of crystals for a pendant. I don't think there was a single bead out of place on this piece, and it felt nice and sturdy after I finished zipping the circle together. And I thought to myself, how interesting that out of such a total disaster area, I can put together what seems to be a perfect piece of beadwork. I don't know about anybody else, but I'm the kind of beader who strives for perfection in her art. I hate to see threads poking out where they shouldn't, broken beads, beads with chipped holes, and lopsided edgings on my bead embroidered cabochons. Visible imperfections in my beadwork drive me absolutely bonkers. Absolutely. If I can't fix a mistake in my beadwork, I'll either tear the whole thing apart or chuck it in a drawer until I feel like cutting it apart. That's just how I am. Sometimes, I can convince myself that a bead out of place is just a Native American "Spirit Bead", but most of the time, that doesn't work. So once again, I find myself pondering the incredible mess that is my work area and the results that come out of that work area: neat, tidy, and technically excellent pieces of beadwork. I think you're right! It's like all the creativity goes out of the room when there are no beads all over the place. And I totally agree about the threads, etc. I have a beautiful russian spiral bracelet that I won't wear, and haven't taken the time to tear apart. It was my learning piece, and there is a break in the pattern that I didn't see until it was finished. So now it's just sitting in my jewelry box, feeling lonely and abandoned! LOL.